On-premise versus on-demand. It’s an offering’s battle that has taken place since the ASP model first took root within the CRM industry over ten years ago. Since then, customers have traditionally been forced to split their decisions between the security of an on-site deployment versus the ease of start-up inherent with an on-demand installation. 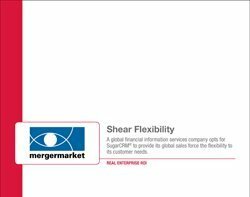 For Mergermarket, a global M&A intelligence and information firm, having the best of both worlds meant flexibility, which in turn meant implementing SugarCRM. Up until 2005, Mergermarket was leveraging Goldmine, a midmarket CRM suite from FrontRange. Rapid growth among its global sales force and the opening of regional offices across the world provided one-half of the impetus for looking into new options, says Jonny Shingles, global head of CRM at Mergermarket. The other half was the nature of Mergermarket’s business.